Langsisa Ri (6427m) is situated in the very popular Langtang Region, 175 km from Kathmandu. Langsisa Ri expedition is popular expedition in Langtang region. Langsisa Ri peak is technically challenging peak. The peak is for those who really like to have adventure in using their experience with full climbing equipments such as rope, ice-axe, ten etc. Langsisa Ri climbing offer beautiful Himalayan views of Langtang Lirung 7246m, Shishapangma 8013m, Dorje Lakpa 6988m, Ganesh Himal 6704m, Naya kanga peak 5867m, Yala peak 5500m. Langsisa Ri Expedition begins at Syabrubensi after 7-8 hours 175km drive from Kathmandu. Asian Hiking Team’s climbing guide led through the beautiful valley of Lama Hotel, Langtang village, Kyanjin Gompa and move towards Langsisa Ri base camp. After successfully climbed the Langsisa Ri, trail continue descend to Syabrubensi or mountaineer can extend their journey to Gosainkunda Helambu valley trekking. Day 01: Arrival in Kathmandu, Our airport representative will pick up you from Kathmandu International airport – transfer to hotel, overnight at Kathmandu hotel (BB). Day 03: After breakfast, Katmandu drive to Shyabru bensi (1420 m) by local bus. Local bus drive approximately 7-8 hours, overnight at hotel (B/L/D). Day 04: Shyabru bensi trek to Lama Hotel (2804m), walk approximately 5-6 hours (B/L/D). Day 05: Lama Hotel trek to Langtang Valley (3500m), walk approximately 4-5 hours (B/L/D). Day 06: Langtang valley trek to Kyanjin Gompa (3800 m), walk approximately 2-3 hours and after lunch climb up to Kynjin Ri 4750m for superb Himalayan views back to Kyanjung Gompa and overnight at Kyanjn Gompa (B/L/D). Day 07: Trek from Kyanjing Gompa to Langsisa Kharka, walk approximately 5-6 hours, overnight at camp (B/L/D). Day 08: Trek from Langsisa Kharka to Langsisa base camp. Climbing guide will teach you how to fixed the rope, how to blay the rope, how to ascend, how to descend etc. walk approximately 5-6 hours, overnight at Camp (B/L/D). Day 09: Trek from Base Camp to Langsisa high camp, walk approximately 4-5 hours, overnight at Camp (B/L/D). Day 10: early in the morning, our climbing guide will take for Langsisa Ri peak (6427m) summit and back to Langsisa Ri peak base camp, walk approximately 6-7 hours Overnight at O/N Tented Camp (B/L/D). Day 11: Trek back down from Base Camp to Kyanjin Gompa, walk approximately 5-6 hours, overnight at Hotel (B/L/D). Day 12: Kyanjin Gompa trek to Lama Hotel (2567m), walk approximately 5-6 hours, overnight hotel (B/L/D). 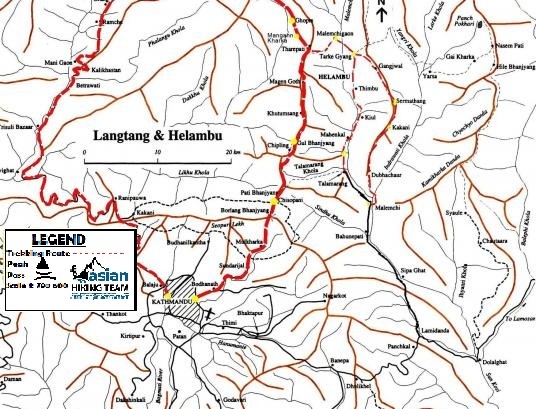 Day 13: Lama Hotel to Syabru Besi (1420m) walk approximately 5-6 hours, overnight hotel.(B/L/D). Day 14: Shyabru Besi to Kathmandu by local/private Jeep 5-7 hours, transfers to hotel (BB). Day 15: Departure from Nepal, Asian Hiking Team drop you airport as your flight time (BB). Day 15: Departure from Nepal. Asian Hiking Team drop you in airports your flight time (BB).